The versatile new iRoar Mic is a career-changing gem for educators, musicians, lecturers, and presenters everywhere. In conjunction with Creative’s Sound Blaster Roar Pro, this battery-powered Bluetooth wireless microphone fills rooms with voice and music. The audio source can be either direct via live voice, direct via external microphone into the iRoar’s AUX port, or remote using the LINE input. The microphone is on the top of the small unit, and the two ports are on the bottom. Pro model is on top. It’s black. Original Roar is dark gray. Charging the iRoar Mic and pairing it wirelessly to an Roar Pro are easy to accomplish. A helpful six-language printed user manual is included. 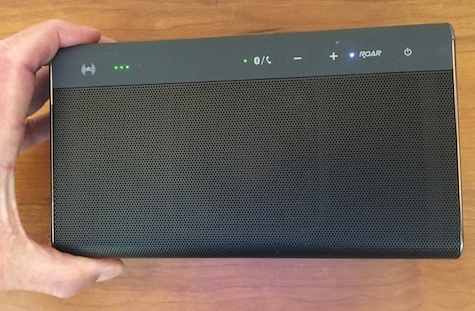 Note that some of the information is relevant to a different product from Creative, the iRoar Speaker, which is much more expensive than either of the two speakers being discussed here. MyMac will be reviewing the iRoar Speaker as soon as a unit is available for our evaluation. 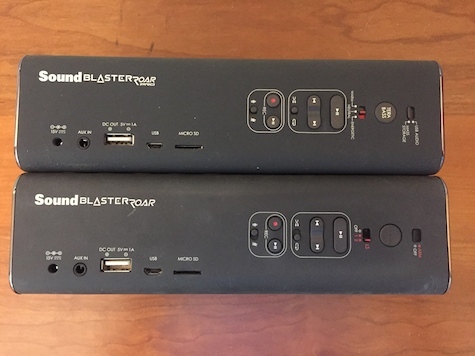 Both the original and Pro Sound Blaster Roar produce exceptional, powerful sound that will make you want to use them as often as possible, either wired or wireless, singly or in stereo pairs. At the current sale prices, the earlier Roar is an unbelievable bargain. Professionals will be comfortable paying twice as much for the Pro model, plus $80 more for the iRoar Mic. The combined forces of these two masterful items provide excellent value and usefulness for enjoyable listening plus audio presentation. I teach weekly guitar lessons using one or the other Sound Blaster Roar, and my students continue to be amazed at the stellar sound from such a compact unit. Much of my work involves public speaking, often in a large meeting room. I have never been satisfied with the PA systems provided. In future I will bring my own audio gear: iRoar Mic and Sound Blaster Roar Pro. They are all I need for hands-free, shout-free vocal projection. I can hardly wait for my first course to begin next semester. Between classes I’ll continue to enjoy single and paired-speaker listening to Creative’s world class Sound Blaster Roars. My favorite personal use of them is playing music louder than loud on my patio while I strum and sing along on the guitar to Internet radio tracks from Deezer and Pandora, in addition to my iPod Classic’s 8,000-song contents. Strong Nemo recommendation for all three of these products!